Are you searching for an exquisite gift for a special woman? Do you want to add a dose of tranquility to her life? 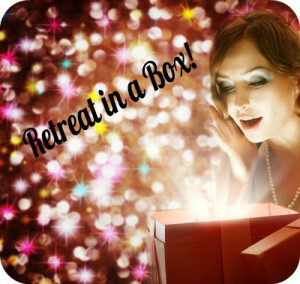 A Retreat in a Box! all gathered together in an elegant box to delight, and pamper her senses. This beautifully wrapped package will arrive at her door brimming with wonderful surprises designed to deliver a relaxing experience and a time of stillness for her. You can have the package shipped to your address and personally deliver this beautiful gift to her. Don’t miss the opportunity to give this wonderful gift of portable tranquility to an important woman in your life. It’s perfect for Mothers, Daughters, Sisters, Nieces, Cousins and Friends. Please call (815) 342-0616 with any questions. PLEASE NOTE: Orders must be received and paid in full two weeks prior to desired delivery date.